Based on USP  Guidance, effective May 1, 2008, Air Viable (microbial) particulate counts are required along side Total Air Particulate counts for Sterile Compounding Facility Certification. With the R2S, RAS, or P100 Air Samplers alongside your total air particulate laser particle counter, you can meet both of these requirements. With the R2S, RAS, or P100, you can monitor bulk production, or support rooms (i.e., ISO 7 and ISO 8), as well critical ISO 5 environments (i.e., Rooms, LAF Hoods and Isolator Barriers) with the knowledge that you won’t add additional contaminants to that environment. As with a laser particle counter, the sampling probe, in this case the sampling head, is placed into the critical environment without the controller unit, significantly reducing the introduction of unwanted particulate matter into the critical zone your are certifying. 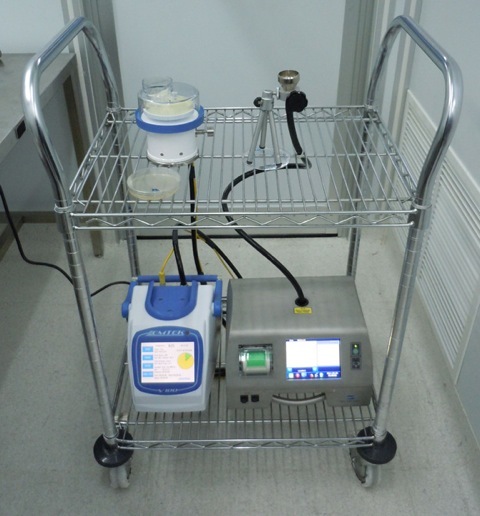 With the P100, the whole device may be placed in an ISO5 environment, and a remote exhaust attachment and tubing can be used to remove the HEPA filtered exhaust from the critical environment.